Aaah, there’s nothing like being able to give away tickets for conferences. This time, it’s one close to my heart, as it’ll be my first speaking gig ever: Build conference in Belfast (November 5th). Created for obsessive-compulsive designers, Build is no ordinary web conference. From internationally renowned speakers to a jam-packed social calendar, Build is bringing the best of the web to Belfast’s Waterfront Studio on the 5th November. With a variety of companion workshops, lectures, parties, meetups and an unconference, Build was created for those enthusiastic about the web and passionate about what they do. The location and speakers (besides me) look great, and I can’t wait to fly over there and spend a day wandering around the city. 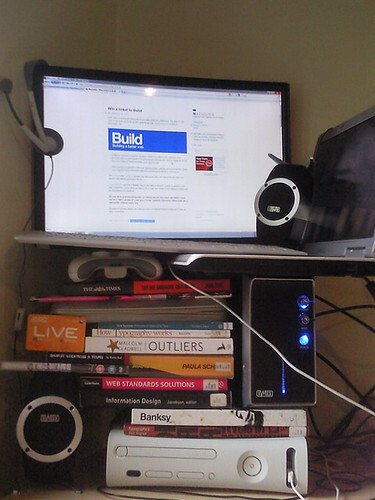 On your desk, grab everything that isn’t bolted into the wall/floor, and Build a stack out of it. Take a picture of it and post it in the comments (maximum 500px wide). Most spectacular/creative stacks win. Deadline is Tuesday, August 4th. Like last time, I’m looking forward to what you’ll come up with :) Good luck! Watch your inboxes for details! @Filip Vanderstappen: Thanks, fixed! (also added the date of the conference, November 5th). As a handy side effect of this competition, I now have to clean my desk. Thankyou. Almost broke a lot of gear. 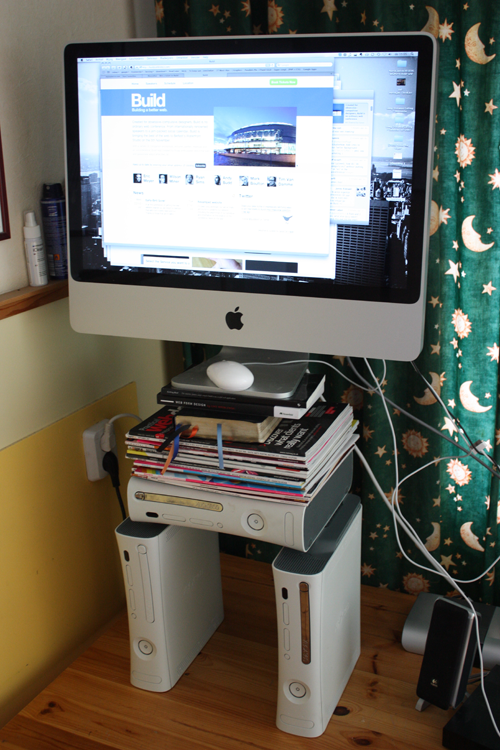 Shame you can’t see all the crap wedged in-between the speakers keeping them at just the right angles for balance. As I took the photo I thought that balancing my laptop on the monitor might not be a good idea. Some milk & hot choco! Ok…Woaalleeeee is on my table…EEEvvvaaaá! I’m loving Maximilian Schöning’s effort. I already have my ticket but this sounded like fun! I proudly present you my ‘Arc de Bazar’. Crap! Let’s try this instead (forgot Textile is silly). Pardon the double post…very tired, need more Dew. Nearly lost a laptop in the process! First time I love having a lot of crap on and attached to my desk. My entry; The Inspiration Tower.